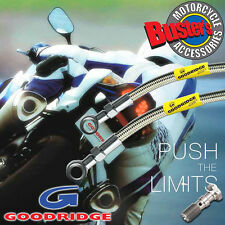 Goodridge Buildaline components can be used to construct any brake or clutch line. Simply select the line length you require in Clear finish and then select the end fittings of your choice along with any banjo bolts you need. The Goodridge20º Banjo Adaptor SBK593-03C Buildaline component can be used to construct any brake or clutch line. Simply select the line length you require in Clear finish and then select the end fittings of your choice along with any banjo bolts you need. 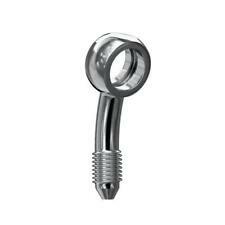 Goodridge Buildaline End Fitting Banjo 45deg 3/8in Stainless Steel. Condition is New. Dispatched with Royal Mail 2nd Class. Suzuki GSXR SRAD 600/750 Etc. Rear Braided Brake Hose. Used, and ready to fit. facilities, any work undertaken at very competitive rates. Goodridge Buildaline 20º Banjo Adaptor 10mm Hole Motorcycle Hose SBK593-03C. Condition is New. Dispatched with Royal Mail 2nd Class. Goodridge Stainless Steel Brake Line RED - For Suzuki TL1000S and Others. Goodridge High Performance lines. These Race-Bred lines are constructed from the finest quality hose, consisting of a PTFE Inner and Stainless Steel Overbraid. and debit card. We cannot be held responsible if these conditions are not adhered to. Braided stainless steel hose - 1205mm. BRAKE HOSE BY GOODRIDGE. New Genuine Goodridge Spare Parts. Item : Brake /clutch hose. Suzuki GSXR1000 K9-L10 09-10 Goodridge Stainless Steel Front and rear Brake Line Race Kit. Condition is New. Brand new old stock, cheapest available. Any questions just ask. 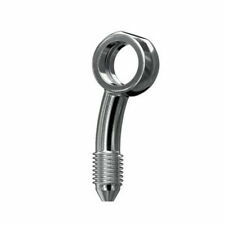 Goodridge kits are manufactured from the highest quality zinc plated steel swaged fittings which are permanently attached to a Stainless Steel braided hose. A highly efficient braking system allows you to get deeper into the corner and onto the accelerator faster. Goodridge Stainless Front Brake Line Harley-Davidson FLST With ABS +10"
We have access to most parts and accessories including Genuine Harley-Davidson. NEW Stainless steel Braided Front brake line Extended Length plus 10" for Harley-Davidson FLSTF FLSTN FLS with ABS 2012 to 2015. Suzuki GSXR SRAD 600/750 Full Matching Set Braided Brake Hoses, Front & Rear. Used, and ready to fit. · Goodridge Buildaline components can be used to construct any brake or clutch line. Simply select the line length you require in Clear finish and then select the end fittings of your choice along with any banjo bolts you need. Goodridge Stainless Brake Line Harley-Davidson FLSTB Length 46 1/2"
We have access to most parts and accessories including Genuine Harley-Davidson. Harley fittings from 1990 have not changed (except 2004 & Later XL Sportster Models, & ABS) so although we list a model that this line will fit straight onto it will fit all models and ideal if you are changing your handlebars simply order the length you require. Each Goodridge ABS brake line kit is manufactured using Stainless Steel ABS blocks, Stainless Steel fittings and PTFE hose wrapped in a Stainless-Steel braid with a PVC outer to stop dirt ingress. 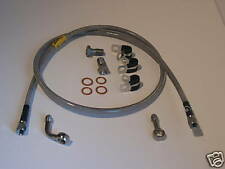 This Goodridge Stainless Steel Brake hose kitcontains 1 hose. We have access to most parts and accessories including Genuine Harley-Davidson. 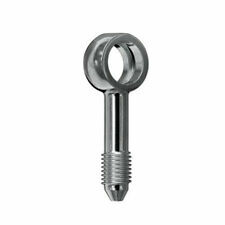 This line is made with the latest type of fittings where the banjo screws onto the line giving you flexibility for change in the future as these can be attached and removed repeatedly. NEW Goodridge Stainless steel Braided brake line for Harley-Davidson single disc front length 57" ideal for ape hanger handlebars. We have access to most parts and accessories including Genuine Harley-Davidson. Part Number 921945. We have access to most parts and accessories including Genuine Harley-Davidson. We have put this kit together using a Junction box designed for single disc ABS brakes. The Junction has 2 screw holes to take the ABS lines and fittings to take 2 screw on style brake lines as shown in our picture. NEW Stainless steel Braided brake line for Harley-Davidson Front with AN3 screw on fittings Length 52". We have access to most parts and accessories including Genuine Harley-Davidson. NEW Goodridge Stainless steel Braided brake line for Harley-Davidson single disc front length 50" ideal for ape hanger handlebars. We have access to most parts and accessories including Genuine Harley-Davidson. Goodridge Stainless Brake Line Harley-Davidson FXD & FXR Front Length 46"
NEW Stainless steel Braided brake line for Harley-Davidson FXD Dyna 1996 to 2005 and FXR 1987 tp 1994 Front. We have access to most parts and accessories including Genuine Harley-Davidson. Eliminates sponginess under heavy breaking. Increases breaking efficiency. These racebread brakelines are constructed from the finest quality hose, consisting of PTFE inner and stainless steel overbraid. We have access to most parts and accessories including Genuine Harley-Davidson. NEW Stainless steel Braided brake line for Harley-Davidson FLH Electraglide models 2008 to 2012. NEW Stainless steel Braided brake line for Harley-Davidson Front with AN3 screw on fittings Length 44". We have access to most parts and accessories including Genuine Harley-Davidson. We have access to most parts and accessories including Genuine Harley-Davidson. NEW Stainless steel Braided brake line for Harley-Davidson FXST 2011 & Later Front with ABS. NEW Stainless steel Braided brake line for Harley-Davidson FXDF Fatbob. Part Number HD0097-3FCH. Standard size on all FXDF Models top line 22" Lower lines 20". NEW Goodridge Stainless steel Braided brake line for Harley-Davidson Softail models Rear 2000 to 2006. We have access to most parts and accessories including Genuine Harley-Davidson. Each Goodridge ABS brake line kit is manufactured using Stainless Steel ABS blocks, Stainless Steel fittings and PTFE hose wrapped in a Stainless-Steel braid with a PVC outer to stop dirt ingress. 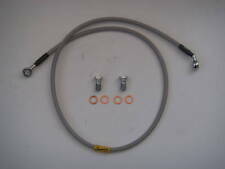 This Goodridge Stainless Steel Brake hose kitcontains 3 hoses. NEW Goodridge Stainless steel Braided brake line for Harley-Davidson Softail FXSTS Springer Front. We have access to most parts and accessories including Genuine Harley-Davidson. 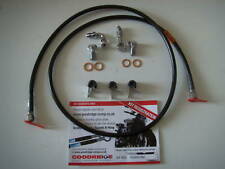 Goodridge AN3 Brake Line System. 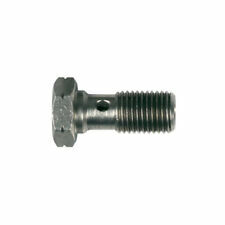 Brake Light Banjo Bolt 3/8" UNF ( 24 TPI ). Ideal Harley & Custom. By request we will list for you any part from anywhere. State Catalog & Part Number. NEW Goodridge Stainless steel Braided brake line for Harley-Davidson XL Sportster models Rear 2004 and later. We have access to most parts and accessories including Genuine Harley-Davidson. We have access to most parts and accessories including Genuine Harley-Davidson. NEW Stainless steel Braided brake line for Harley-Davidson Front with AN3 screw on fittings Length 50". We have access to most parts and accessories including Genuine Harley-Davidson.